Keeping your iron clean is an important part of iron maintenance. Even if your model has an anti-calc system or self-cleaning features, you should clean it as necessary to avoid build-up that can damage the iron or ruin your clothes. If you are unsure of how to clean a steam iron the right way, or even if you have an idea but may not know how to clean an iron with vinegar, just check out the helpful tips below. Cleaning an iron with vinegar may seem strange, but it’s actually one of the easiest, safest and most cost-effective ways to clean it from the inside. Fill the water tank about ¼ of the volume with white vinegar. Turn the iron on to a middle heat setting. Iron and steam the dry cloth until the tank runs out of steam. Fill the tank with distilled water. Spray and iron the towel again, or use a new one if necessary. Depending on your perspective, cleaning the iron plate may be much easier. You can use any of the following methods when cleaning a steam iron. Mix three tablespoons of baking soda with two tablespoons of water or white vinegar or any ratio that forms a loose paste. Apply the paste to any part of the plate with rust, build-up or stains, and let it settle for 30 to 60 seconds. Make sure to avoid getting the paste into the steam ports, then wipe with a damp cloth. Pour a couple of teaspoons of salt over a towel. Turn the steam off on the iron, and iron over the salted towel. The salt will help attract dirt, remove stains and allow the plate to glide more smoothly. Dip a clean cloth or towel in water or white vinegar, but make sure to squeeze out excess liquid. Turn the iron to a very low temperature, and wipe the sole-plate with the cloth. Use a cotton swab to get deep into the steam ports. If you wish for a truly clean steam iron, you can’t forget to cover the outside of the unit as well. If you need to know how to clean a Rowenta iron or any similar design, continue reading for easy tips. Use the scrubbing pad to remove any loose debris from the outside of the iron. Lightly spray your cloth or towel with the iron cleaner or other gentle cleaner. Wipe the entire exterior of the iron without covering the sole-plate. If there is still grime or debris, spray the scrubbing pad until lightly damp. Scrub any stuck on residue until clean. Wipe the iron dry, or spray the cloth with water and wipe it until all traces of build-up and cleaner have been removed. Make sure your iron is fully cooled and unplugged before attempting to clean it. Read the manufacturer’s instructions before using or cleaning the iron to know what type of water to use and how to maintain the device. You don’t have to clean your iron at regular intervals as your usage will vary. Clean your iron as necessary. Avoid using metal scrubbing pads or harsh chemicals that may cause damage to the exterior or plate of the iron. Make sure the water tank is empty after using and after cleaning the iron. This will prevent minerals in the water from accumulating inside. The more chemicals you use when ironing clothes, the more likely you are to experience clogging and need more frequent cleanings. Be sure to avoid getting liquids or other substances in the iron’s steam ports. Many iron brands provide their own chemicals to assist you in the cleaning process, but the aforementioned substances are natural and cost-effective. 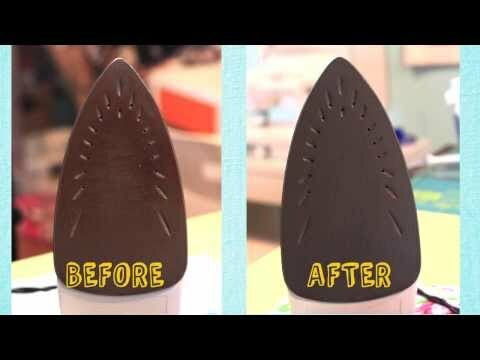 These methods also provide easy and safe ways to clean an iron without hassle. The most important part of the process is actually getting the iron as clean as possible whenever you notice it needs cleaning. This goes a long way in making your appliance last longer and making ironing much easier in general.